People hug while looking at Notre Dame Cathedral in the aftermath of a fire that devastated the cathedral. 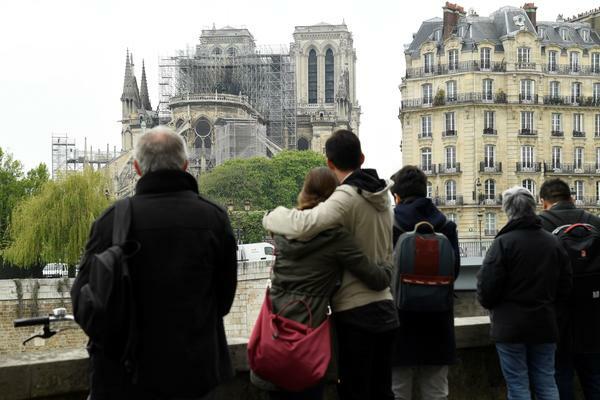 In an address to the nation Tuesday, President Emmanuel Macron said Notre Dame will be rebuilt "more beautiful than ever" and he wants to see it done within five years. "We can do it and we will come together," he said. Construction first began on the Catholic cathedral in the year 1160. 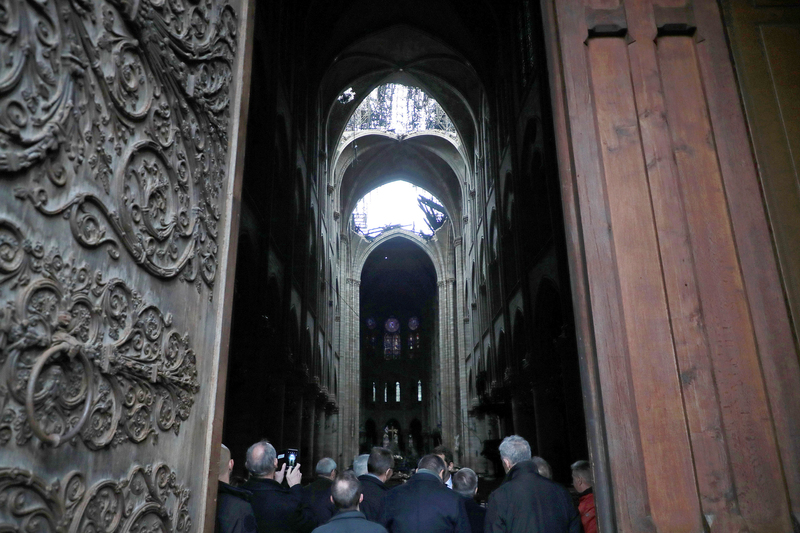 For 850 years, the house of God was a fixture of the Paris skyline and so it also became a house of man, "part of our French destiny," as Macron tweeted Monday. 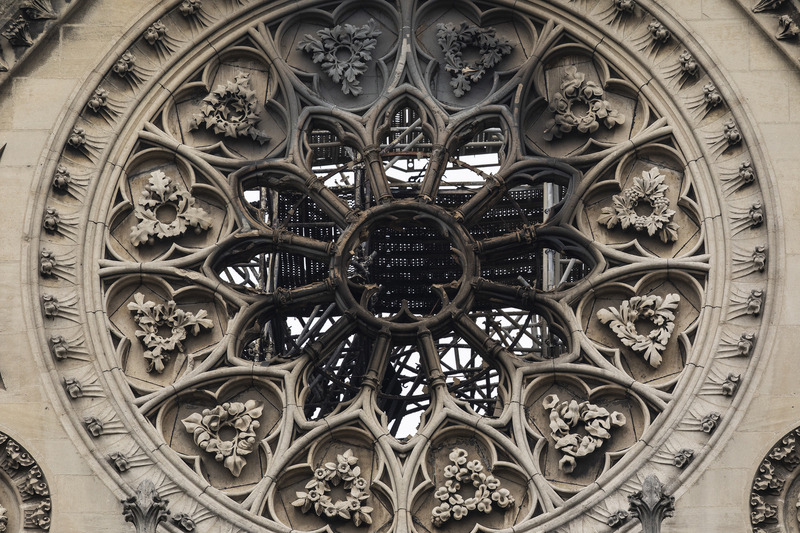 Notre Dame's destiny was in question through the night as four hundred firefighters worked to put out the blaze. They managed to contain the flames early Tuesday morning local time. Fire damage is visible on the exterior of Notre Dame Cathedral. By mid-morning the fire was fully extinguished and an investigation into the cause began in earnest. Paris public prosecutor Rémy Heitz told reporters the fire was discovered in the attic's framework and is believed to be accidental. Investigators in the early stages of a probe, he said, have detected no signs of arson. But Heitz cautioned the investigation will be "long" and "complex" as dozens of investigators work to uncover what happened. Part of their job is interviewing workers who were engaged in a multi-million dollar restoration project of the cathedral before the fire broke out around 6 p.m. local time Monday. Nobody was killed. Officials said two police officers and one firefighter were lightly injured. But the toll taken on the priceless works of art within the cathedral, including paintings, tapestries, statuary and famed stained glass windows, could be worse. France's Minister of Culture Franck Riester said some of the most significant treasures had been saved, including a crown of thorns Jesus is thought to have worn during crucifixion. 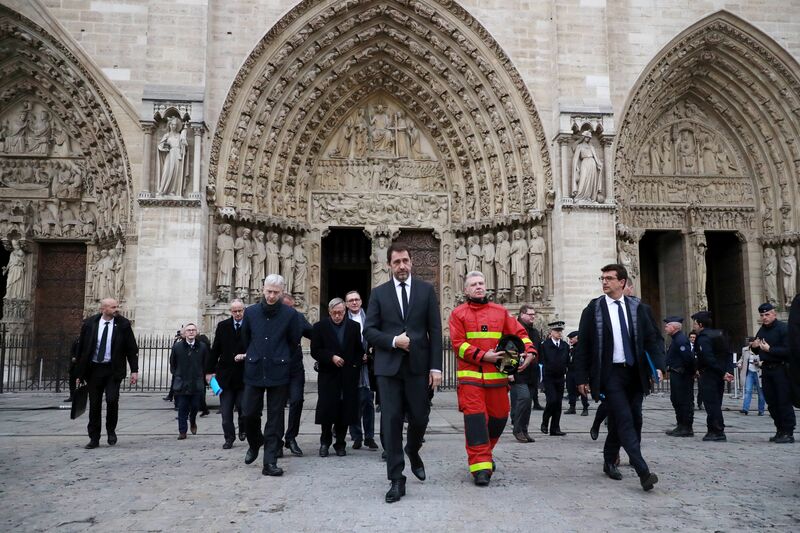 French Interior Minister Christophe Castaner (center) and Paris Fire Brigade Commander General Jean-Claude Gallet (center right) exit the Notre Dame Cathedral. 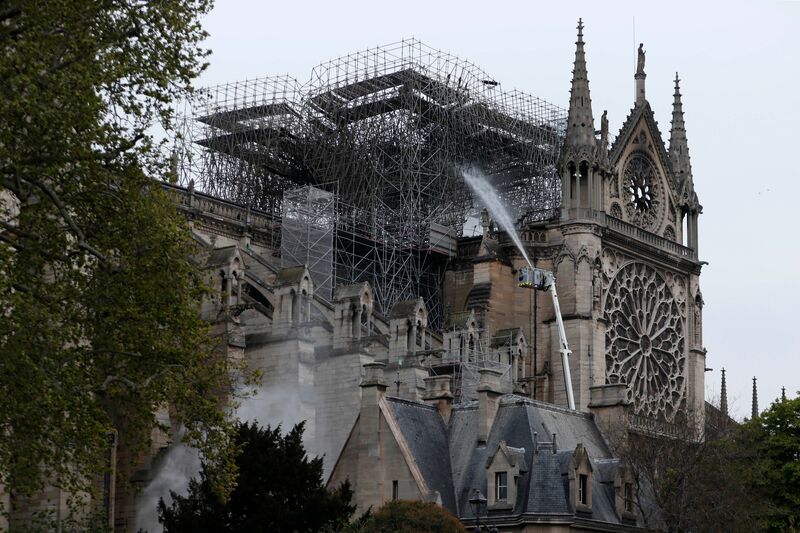 French investigators probing the devastating blaze questioned workers who were renovating the monument, as hundreds of millions of euros were pledged to restore the historic masterpiece. Firefighters spray water as they work to extinguish a fire at Notre-Dame Cathedral in Paris early on Tuesday. A huge fire that devastated Notre Dame Cathedral is "under control", the Paris fire brigade said after firefighters spent hours battling the flames.